Why not use our 1-Inch Irish themed badges in your St Patrick's Day celebrations, they make fun keepsakes. 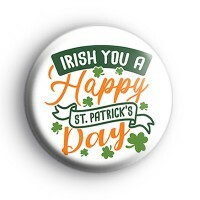 This St Patrick's themed badge has the text, IRISH You a Happy St Patrick's Day written in a fun font & a green top hat, a golden horseshoe and a few lucky green shamrocks. We have lots of St Patrick's Day badges in the shop, so make sure you take a look at those before checking out.